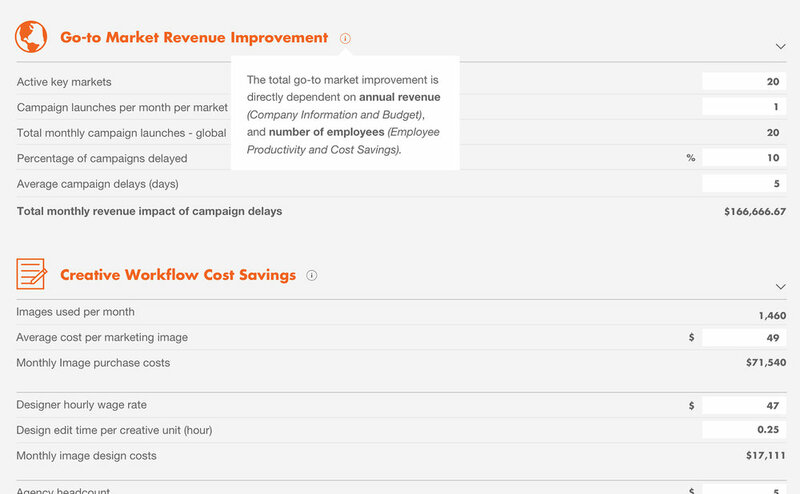 Percolate is a Content Marketing System aimed to help improve end-to-end marketing processes. It is the source of truth for all initiatives and helps marketers scale their operations, ensure consistency and transparency, and deliver cohesive experiences across the entire enterprise. The sales team at Percolate is a primary stream for reaching and expanding customer partnerships, as well as building meaningful and lasting relationships. Communicating with these potential customers and identifying business challenges allowed the sales team to customize solutions that fit to their unique needs. 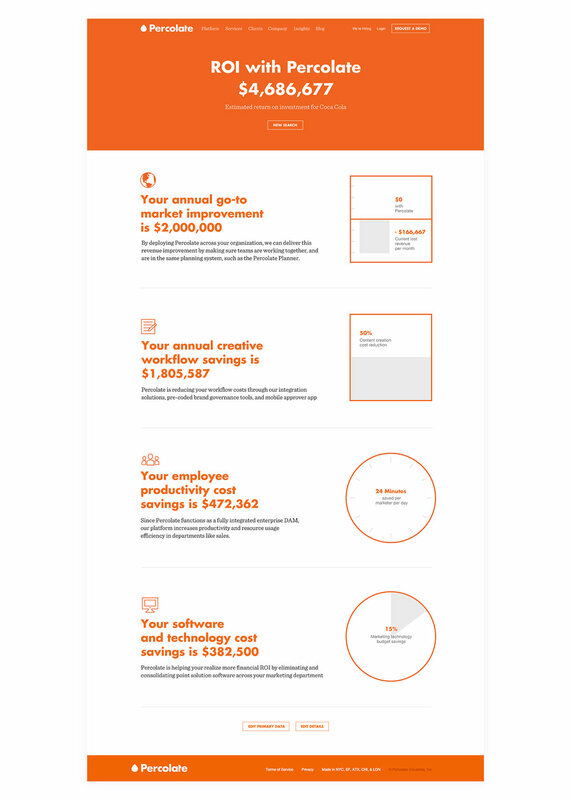 To help leverage those conversations, I partnered with various teams at Percolate and designed an ROI calculator to help validate the benefits of deploying their software. The tool was designed for internal use which would allow the sales team to walk customers through distinct areas in which they would see significant cost savings by using Percolate. This project was heavily dependent on conversations, and many of them. I reached the Director of Growth and Lead Engineer. This was to understand the intent, capabilities and expectations of this product, how to actually use it, and how to produce accurate results. I reached the Sales team. This was to understand their “script” - how they currently speak with customers when pitching Percolate, and how they intend to discuss their ROI with a powerful calculator to help lead the conversation. I reached my Creative Director. This was to discuss ideas around the experience from start to finish, and how to organize dense information in a smart and visual way. A majority of this project was spent collaborating with these groups, sketching ideas, and wireframing organized concepts. Two successful ideas were pitched at this stage, both reaching the same goals in different ways, the main variance being the level of simplicity. The outright simplest solution led the charge to visual design. This adaption of an ROI calculator gave the sales team more of a runway to actually talk to the customer about their savings, instead of fumbling through many inputs that could have easily resulted in a clunky, distracting conversation and overall experience on both sides.